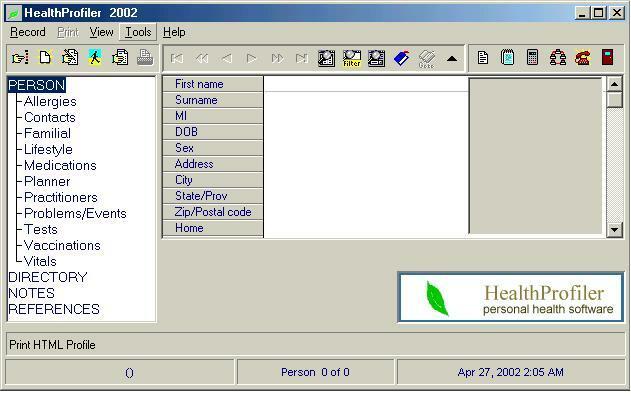 NEW HealthProfiler 2002 Software gives you control over vital health data. Create health records, and keep a journal of events. Keep track of doctors, therapists, programs, insurance providers, and institutions. Research health topics, create a library. Record fitness data. Print summaries. All this and more for $15.00 - we think it's the best health value on the Web! It's exceptionally easy to use - just point and click, with simple edit windows.Click here to learn more. HealthProfiler 2002 has an array of features that help you plan your health-care, and organize health records and vital information. We still offer the 'original' HealthProfiler for Win 3.1+ and up, at $10.00 (product #6757). It has all the record keeping and printing features of HealthProfiler 2002, with a similar user friendly interface. If you have an older system, or just want to save a few dollars, this is a terrific value. Check it out. Support and FAQ - check our Support page.